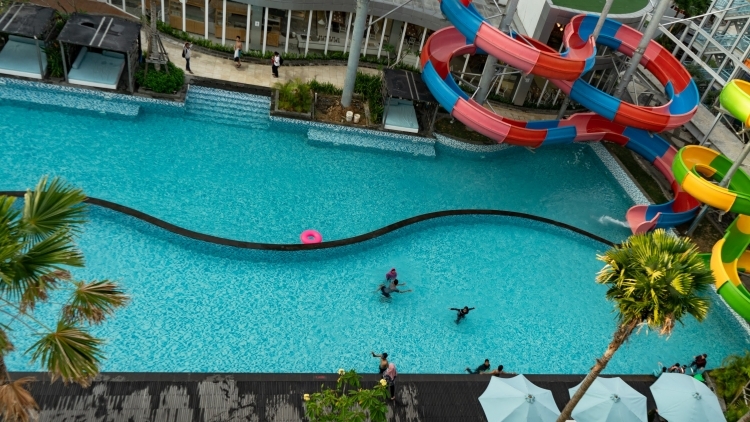 Aquaboom Waterpark is the one and only waterpark in Indonesia that is located on the 7th floor of the Pentacity Shopping Venue which is attached to Astara Hotel Balikpapan. This area is an integrated commercial district belongs to PT. Pintu Air Mas Group (PAM Group). Aquaboom Waterpark launched to public in October 2017 and on June 2018 they decided to upgrade its waterpark facility by adding another four new exciting water slide attractions, including the most exclusive led "glow in the dark" slides, that is currently the only one exist in the market to date. How to visit Aquaboom Waterpark? If you are interested in visiting Aquaboom Waterpark you may enter from passenger lift located in Astara Hotel Balikpapan. Once you are on the 7th floor of Astara Hotel Nicopolis Lobby, you go to Aquaboom Waterpark main reception area located just next to Astara Hotel reception counter. Aquaboom Waterpark has total area of over 8000 square meter space that is occupying almost 80% areas of the 7th floor of the Pentacity Shopping Venue. It's an outdoor water adventure park complete with its private locker rooms, showers, bathrooms, toilets, musholla and 350 seating capacity of Tropical Food Court in its waterpark. Entrance is variety from Rp. 90.000/person on weekdays and Rp.120.000/person on weekends. Aquaboom Waterpark may charge higher price on high seasons range up to Rp. 150.000/person, it normally applies during school holiday or national public holiday such Lebaran holidays, Christmas holidays or New Year's holiday.